During October, National Pork Month, we’ve featured pulled pork, 3-1-1 ribs, and shared our best recipes for pork steaks. But we saved the best for last: porchetta. Porchetta (pronounced “por-ketta”) is a spectacular roulade of pork—whole hog traditionally, or shoulder or loin—rich with crisp belly fat, blasted with garlic, herbs, salt, pepper, and citrus zest. Ancient cookbooks housed in the Vatican library suggest porchetta, which was traditionally spit-roasted over juniper wood fires or roasted in pits, originated in the Roman town of Ariccia as early as the 13th century. Today, porchetta is a popular street food in the city, hawked from white vans and typically sliced and served on panino. Porchetta came to North America via Italian immigrants in the early 1900s. In Philadelphia—a town that knows a thing or two about sandwiches—porchetta is simply known as “roast pork”; it is served on a crusty roll with melted provolone and sautéed broccoli rabe or spinach. (Order it at Reading Terminal Market.) Another North American porchetta hub (where it is spelled porketta) is Sudbury, Ontario. Brought to this remote region by Italian nickel miners, locals still play “Porketta Bingo” on Saturdays. The prize? A pound of sliced dill-inflected porketta. Count me in. While porchetta does make amazing sandwiches, its highest calling (IMHO) comes when it’s served whole. Your friends will gasp with admiration when you slice through the mahogany-colored crackling-crisp pork skin to reveal luscious layers of meat and pork fat, then shingle it on a large platter with grilled oranges and sprigs of fresh herbs. It’s perfect for the holidays—relatively inexpensive, easy to slice, and a guaranteed crowd-pleaser. 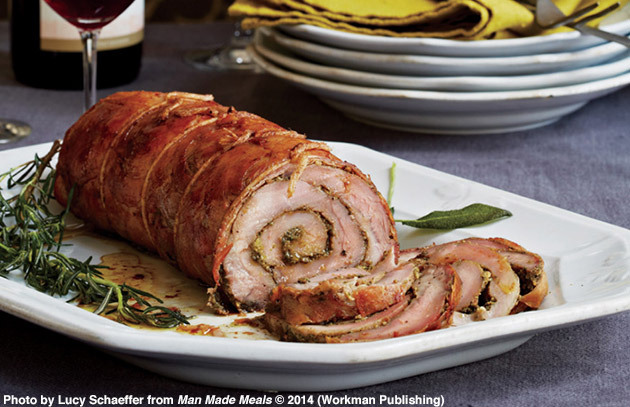 One good place to start if you’re a porchetta virgin is with my recipe in Man Made Meals. Instead of a whole pig, my less intimidating version begins with a butterflied pork loin and exchanges pork belly for pancetta—Italian uncured bacon. Acquire a 6- to 7-pound unskinned pork belly. (Some butchers will special order pork belly for you. Or you can buy them online or through Whole Foods.) Using a sharp knife, score it in a diamond pattern on both the meat and skin sides. Sprinkle with salt and refrigerate, skin side up and uncovered, for at least 24 hours. Follow the recipe through Step 2. Lay the pork belly skin side down on your work surface. Place the cylindrical pork loin in the center of the pork belly. Roll the pork belly around the loin until the loin is fully encased. Tie at 1-inch intervals with butcher’s string. With a sharp knife (an electric knife works well), trim any overhanging belly even with the ends of the loin and reserve for another use. Set up the grill for spit-roasting and preheat to medium (350 degrees F). Run the spit lengthwise through the center of the porchetta, securing it on each end with the rotisserie forks. Spit-roast the meat until the outside is sizzling and brown and the internal temperature of the roast is 155 degrees F when read on an instant-read meat thermometer, about 3 hours. Remove the spit and the butcher’s string. Let the meat rest, uncovered, for 10 minutes before carving. Again, an electric knife works best.